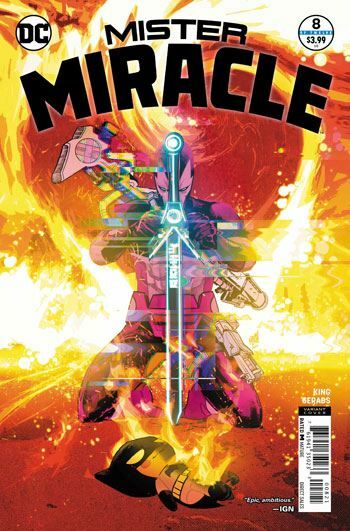 Tom King and Mitch Gerads pull off another amazing issue of Mister Miracle. The story deals with Miracle’s battles on Apokolips, and Scott Free raising his child. The story jumps back and forth between the two, as he and Big Barda take turns in love and war. 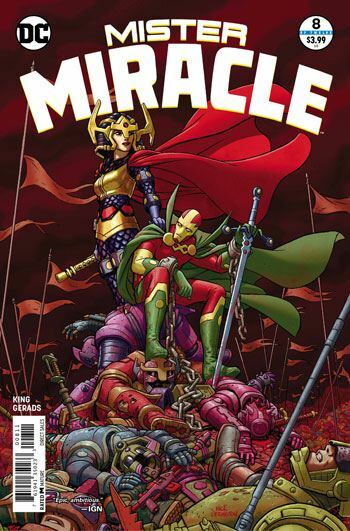 Since the story is told entirely from Miracle’s perspective, Barda is largely unseen, though the pair do their best to communicate. Each issue of this series has used very clever and unusual storytelling techniques, and this issue continues that enjoyable trend. Two of Miracle’s old foes, Virman Vundabarr and Kanto, make appearances in this story, fighting Scott. I quite enjoyed how much better one of them fared than the other. I guess I should have said three of Miracle’s old foes, as Funky Flashman is not exactly a good guy. I love how great the sleazy old con man is with the baby, showing that there is good in the worst of us. There is also a particularly uncomfortable scene, in which Miracle finds himself facing a baby parademon. At least Miracle thinks it’s a child. Lightray sees it differently. The harshness of the scene, and of the battle sequences, contrast so powerfully with the scenes of him singing to his child. I have a theory about what is happening in this series, based on the use of the Lump, and the periodic panels that seem to go on the fritz, I think that all of the events in this miniseries are taking place in Scott’s mind, and that he is hooked up to Lump, and “battling” it, in the weird way that creature functions. Perhaps I am wrong, but it does account for a lot of what happens in this book, the deaths of massively significant characters, and the exceptionally rapid sequence of events. I mean, geez, Barda just announced that she was pregnant, and the baby is already growing up. Whether I am right or wrong, I really don’t even care. This is a truly wonderful book, brilliant in both art and story.